BOTTOM LEFT Nate Wasylenchuk with a bee. BOTTOM RIGHT Danny and Sasha Wasylenchuk. in the past few years. 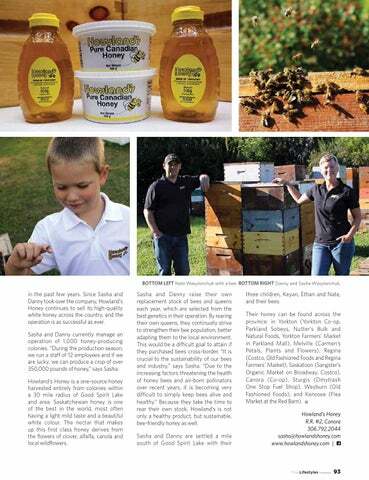 Since Sasha and Danny took over the company, Howland’s Honey continues to sell its high-quality white honey across the country, and the operation is as successful as ever. Sasha and Danny currently manage an operation of 1,000 honey-producing colonies. “During the production season, we run a staff of 12 employees and if we are lucky, we can produce a crop of over 350,000 pounds of honey,” says Sasha. Howland’s Honey is a one-source honey harvested entirely from colonies within a 30 mile radius of Good Spirit Lake and area. Saskatchewan honey is one of the best in the world, most often having a light mild taste and a beautiful white colour. The nectar that makes up this first class honey derives from the flowers of clover, alfalfa, canola and local wildflowers.